Petersburg bed and breakfast travel guide for romantic, historic and adventure b&b's. 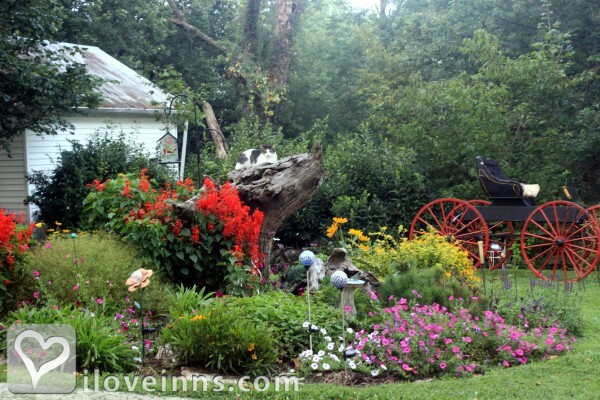 Browse through the iLoveInns.com database of Petersburg, Kentucky bed and breakfasts and country inns to find detailed listings that include room rates, special deals and area activities. You can click on the 'check rates and availability' button to contact the innkeeper. Petersburg is a Kentucky community that lies close to Cincinnati. Among the attractions are Cincinnati Children's Museum Center, Eden Park, Essex Art Center, Hillforest Museum, Kings Island, Krohn Conservatory, Newport Aquarium, Footlighters-Stained Glass Theater, and Pendelton Art Center. Perfect North Ski Area is one of the favorite spots near the village of Petersburg. The historic sites visitors should see are Cathedral Basilica of the Assumption, Dinsmore Homestead, Historic Hill Forest Mansion, and Rabbit Hash Historical Society. More information about the many attractions in the area can be provided by Petersburg bed and breakfast innkeepers. For those who are planning to dine in the best restaurants, they may consider Applewood, Chateu Pomije, and MainStrasse as options. By First Farm Inn. Petersburg, Ky, was a the little river town mostly decimated when riverboat traffic ceased and prohibition closed its distillery. Tousey House restaurant in Burlington and Hebron Grill are nearby offering good food. Right across the Ohio River is Perfect North Ski Area. Hike or bike the paved path along the floodwall in Lawrenceburg after sampling Riverwatch (a barge restaurant floating in the river), Acapulco's Mexican Restaurant, the shops of downtown Lawrenceburg, Indiana. Third and Main restaurant in Aurora, Indiana is just a few blocks from the riverfront park that hosts many festivals. Downtown Cincinnati is 20 minutes away, and just across the Ohio -- Newport and Covington Ky, offer a huge diversity of music, theater and restaurants. By First Farm Inn. Western Boone County is rolling hills along the Ohio River just southwest of Cincinnati, Ohio. Rabbit Hash Historic District is a great place to taste local wines and meet singers with guitars and banjos who pick Bluegrass at the General Store. Head on to Dinsmore Homestead to learn about this well-connected family and their farm. Then hike around Big Bone Lick Historic Site where Louis and Clark visited to take mammoth and mastodon bones back to Washington where Thomas Jefferson and Ben Franklin pondered how elephants got to the New World. By First Farm Inn. Hebron and Burlington, Kentucky, Lawrenceburg, Greendale and a little further from Aurora, Indiana. Depending on the season, festivals and traffic, there's Indiana's river cities for a meal on the river. Both small Kentucky towns can be accessed without driving on an interstate if you're willing to try roads made from old buffalo trails. Just 20 minutes away is downtown Cincinnati and Northern Kentucky with many options for music, theater and dinning. By First Farm Inn.